I kind of feel like I’ve come full circle. I first started doing these evaluations back during Avacyn Restored and here we are again, back on Innistrad in the last set of the new block. I’ve become a much better limited player since then, but there is still a lot of work to be done so I’ll be continuing to flex my evaluative muscle over the next few years until I can run with the best of them. Today I’ll be continuing Eldritch Moon’s impact on the limited format, but before we move on be sure to check out the previous article I wrote about Shadows Over Innistrad’s blue cards. 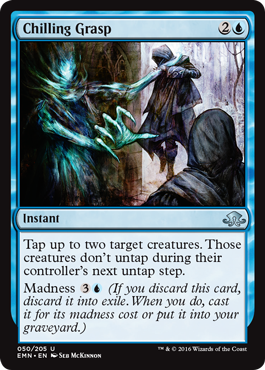 Blue had some good cards that worked alongside madness, letting you discard them and giving you a way to get them back in your hand like Geralf’s Masterpiece and Stitchwing Skaab, and it also has some fairly popular tempo effects. UR and UB Madness could be pretty powerful in the right hands, but UW Flyers was probably one of the better archetypes for blue. I was also pretty surprised how strong UG Clues could be with the right pool. Let’s see how EMN’s blue cards change things up. The first thing we see with EMN’s blue cards are that they are much more efficient than before. Even the name of the card says so. 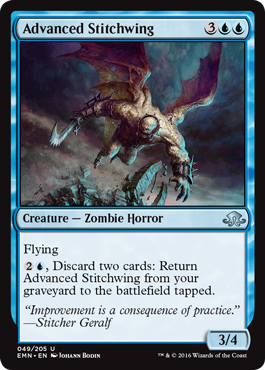 Advanced Stitchwing costs 1 mana more than Stitchwing Skaab but gives you 3 more toughness and has pretty much the same ability. It works great in a UB or UR madness deck, but would fit perfectly fine in a UW Flyers deck as well. It will trade with most of the other flyers and come back for more as long as you have the cards in your hand to pitch to him. Not a first draft pick, but I’d take him early nonetheless. Also keep in mind that these type of cards work well with the new Emerge mechanic as well. Sac it to make the Eldrazi 5 mana cheaper, then discard 2 cards to get him back. 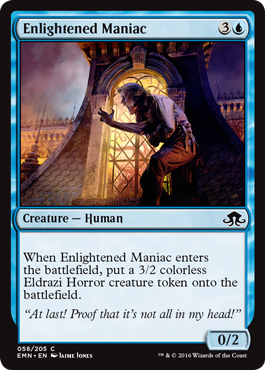 Enlightened Maniac isn’t super by itself, but the token it creates when it comes into the battlefield is great. Two bodies in one card, especially a 3/2, is worth the cost. Good card to have if you want to play Emerge creatures early but still get value for playing them, and also a great target for blink effects. I think this will be a roleplayer in EMN/SOI blue decks. It should see a decent amount of play. Even if you’re not playing Emerge creatures, I think it would still sneak into your 23 cards for a limited deck. Tons of zombies, as well as Horrors in blue. This means cards like Gisa and Geralf will be bombs in limited, and also that there are a lot of creatures that won’t bounce when you play a Thing in Ice and flip it. TITI could become a liability when you play it in this format, but I think most of the time there won’t be too many people playing UB zombies. But I digress. 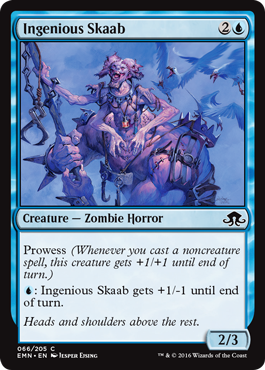 Ingenious Skaab fits on a blue deck’s curve perfectly, and being able to pump it up to a 4/1 or higher with a Prowess trigger makes it a worthy addition to your 23. Another roleplayer for any blue deck, especially one with a few ways to activate its trigger. Curious Homunculus might take some creative deck building to flip consistently, but in a devoted UB or UR madness with 7-8 instants or sorceries I think you can count on him to flip by turn 6. 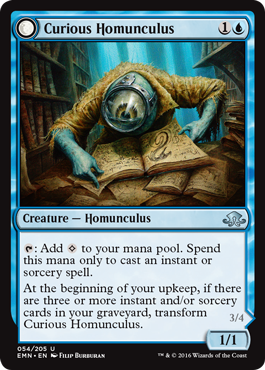 This is a card you’d want to play with Scour the Library, Epiphany at the Drownyard, or Pour Over the Pages. It works well with Escalate spells as well. It won’t fit in every deck, but I think it would be a good addition to a deck that’s light on creatures but has some powerful spells. Better in draft than sealed. Geez. 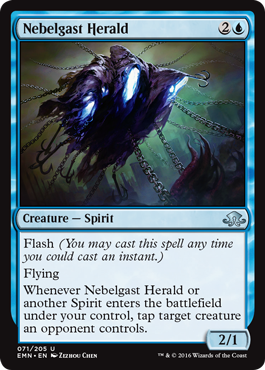 Between Rattlechains, Nebelgast Herald, and Drogskol Shieldmate, your opponent is going to be having fits. 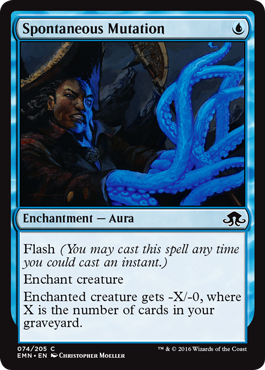 With all of the sorcery speed spells in this format, flash is going to be really powerful. Being able to flash in half of your team at the end of your opponent’s turn to sidestep their removal is going to cause some big swings in tempo, and tapping a creature WHENEVER you cast a spirit is huge too. UW spirits will definitely be a thing, with or without flying. There are plenty to be sure, and they have some great combat tricks. Limited all-star that will see a lot of play in blue decks and absolutely wreck opponents playing against it in UW spirit/flyer decks. Only drawback is the 1 toughness. High draft pick. 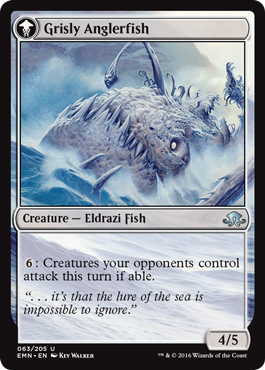 A 2/3 creature for 3 mana is good enough to be played in limited regardless of its abilities, but Grizzled Angler might not be as hard as you think to flip. Between Eldrazi and artifact creatures, you should be able to get something in your graveyard with the right pool. If you can’t do it often, its still a 2/3 that fits well on your curve and gives you a nice bonus if you’re patient. Not a high pick, but don’t overlook it in decks with 2-3 colorless creatures. Having access to discard effects can turn him into quite the combat trick as well when blocking if you hold onto your colorless creature until the time is right. I see this more as a tempo spell that gives you a 1/3 body afterwards than anything else. Fogwalker fits well in the spirits archetype and is easy to cast, and his toughness lets you handle decks focusing on a quick strategy. There are much better spirits though than him, but being able to flash him with Rattlechains in play, or playing some combat tricks to boost his power when he sneaks past your opponent for damage are good uses of Fogwalker. His toughness ensures that any creature that might block him won’t be able to kill him either. Definitely playable in a spirits deck, but probably playable in any other blue deck as the 23 card. Blue just doesn’t stop with it’s Sleep effects. Chilling Grasp is one of those rare cards that you’d rather cast for it’s regular casting cost than it’s madness cost, but it does give you the option of discarding it for an ability like Advanced Stitchwing’s and still get its effect. 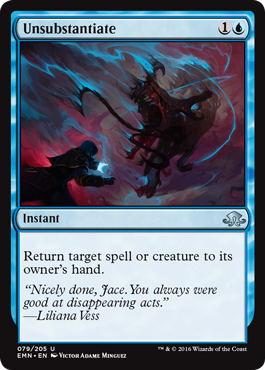 The instant speed and two targets makes it much better than Press for Answers or other tap effect, and I think this card will be worth a slot in any blue deck, especially one built around tempo like UG or UW. Not sure if this is better than Gone Missing, but it replaces itself right away instead of giving you a clue that you have to pay 2 mana to use which is good. It’s also only 3 mana which makes it a lot easier to cast. It looks like the EMN/SOI limited format is going to be split into two types of removal strategies. If you can’t draft the good, permanent removal like Murder, your back up is to go heavy into tempo effects which blue has in spades. Drag Under is playable and should see a good amount of play. Not a bad card to have in your deck. I’m not a big fan of playing counterspells in my deck, but Unsubstantiate lets you still have that option (somewhat) while also acting like an Unsummon. If your opponent is looking to spoil your fun with a naughty little combat trick, this card will stop them dead in their tracks and give you some information about their hand so you can prepare for their next move. Another solid tempo spell that fits into any blue deck. White had some impressive enchantments and blue doesn’t seem to want to be undone. At one mana and with flash, this is a great tempo play on both offense and defense. It will work best in a UB or UG Delirium based deck that can put a few cards in the graveyard early on. I also like being able to reuse it if you are playing UW and have an Ironclad Slayer. With less “investigating” being done in EMN limited, you might find it harder to get card advantage which means those spells that draw you cards shouldn’t be looked over. In a UB madness/delirium deck, the main reason for playing these type of cards is to give you more resources to play with. 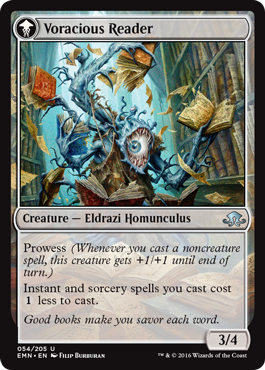 If your strategy focuses on keeping the pressure on your opponent or quickly getting to your bomb, consider playing 1-2 draw effects like Scour the Library in your deck. It’s very likely you’ll be able to play this for 4 mana at the end of your 5th turn. Exultant Cultist – It’s a bear that draws you a card when it dies, and it helps to lower your mana curve if your deck is a little top heavy. 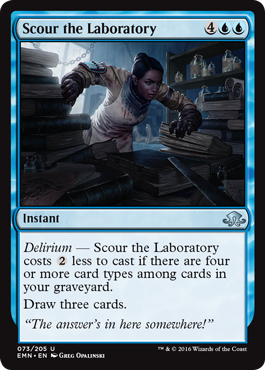 Laboratory Brute – There are other 4 mana 3/3s that I’d rather be playing, but in a delirium devoted deck it’s a good addition. The zombie typing is good too. Tattered Haunter – good for UW flyers/spirits. I wouldn’t play too many, but having an early creature to get in some damage in the air is worth considering. Spirits were pushed pretty hard in this set and it will definitely be an archetype in this format, but I’m a little underwhelmed by the other cards. The tempo effects are satisfactory, but seem to pale in comparison to the improved white, black, and red removal effects in Eldritch Moon. The number of zombies has also increased which should be a boon for those wanting to play UB zombies along with Geralf and Gisa. You should have no problem building a deck full of zombies to take advantage of Dark Salvation and Cryptbreaker. 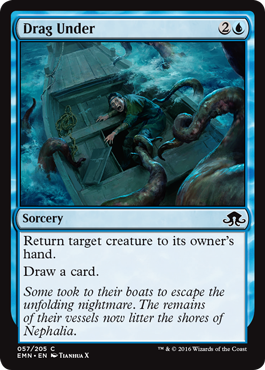 Aside from UB and UW, UR tempo/madness should still be viable to an extent, but I think UG Clues might get worse in SOI/EMN limited with less access to clues. What are your thoughts on blue and how will the new cards effect the various archetypes? I only have a limited amount of time to delve into what will probably be an incredibly deep sealed/draft experience, so I’ll live it to all of my readers to think about the cards more in depth and muse on the other uses and combinations I might have passed over. Be sure to leave any comments about the color down below! Thanks for reading, and join me tomorrow afternoon for our next color, Black.